Sometimes people want more than just pretty decorations for their aquarium, sometimes they want to create a theme in their home. This trend is becoming increasingly popular as people start seeing fish tanks as not just a place to hold your pet fish in, but also as a piece of furniture that can become the centrepiece of a room and an attraction in itself. It’s the least your fishy friends deserve. Obviously there are a ton of different themes and styles that a fish tank could have, so we have picked some of the best that we could find and what we think would compliment any room. Although I’m not exactly the most stylish guy on the internet (I only recently discovered that my trousers are not supposed to be tucked into my socks) I think I have done a pretty good job at picking some cool themes. If you don’t agree, please send me an angry email. Let’s get on with the list! It might seem pretty obvious to start with the most famous sponge in the whole world, but Spongebob is such a popular choice of decoration and is so popular on FishTankBank that we just had to include the happy fella in this list. 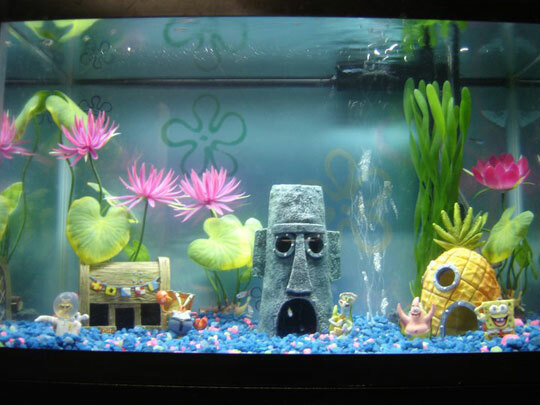 There are a few ways that you could create a Spongebob style aquarium for your fish, but the way we would start is by adding Spongebob’s house, the Krusty Krab restaurant and maybe even grump Squidward’s home that looks like the Easter Island statues . Then just add a few characters and BAM you have your own little mini Bikini Bottom! We have added a few of the items you might need to start building this mini city, just click on the images to check the item out over on Amazon. This set has every item you could possibly need to build Bikini Bottom, and has a ton of positive reviews over on Amazon, so click the button to check it out now! This chilled out theme is a long way from the hectic cartoon world of Bikini Bottom, but could be an awesome idea if you like to have a relaxing environment for you and your fish. 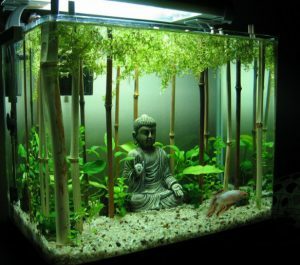 Plus, the bamboo and leaves give your fish the opportunity to have lots of hiding places and areas to get cover, which is similar to what they would have in their natural environment. This bamboo forest style can be easily achieved with just a few simple items, all of which can be found on our post dedicated to Asian style decorations. Embrace the chill! 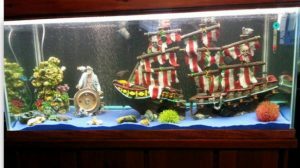 Pirates are a classic way to decorate your fish tank, and can create a really cool feel to your aquarium. There are a ton of different items that you could add into the fish tank to create a pirate world for your fish, but you want to avoid cramming too many objects in there. Although fish do enjoy having cover and the chance to hide away from sight occasionally, they also need plenty of space and room to breathe. With this in mind, we have selected a few quality items that we think any pirate themed tank should totally include to create a cool pirate effect. Click on the image or button above to check them out! So there we have some awesome decorations that you can use to create a unique theme for your aquarium. Having it’s own style will not only make it more attractive, it will also help your fish feel more at home. We think that filling your tank full of items can be a great way to create a natural environment for your fish, even if it is just Spongebob characters! Themed aquarium decorations are a really great way to make your tank fit into the decoration of a room that you have spent ages designing. It was the only way my wife would let me include my tank in our living room! She had spent ages selecting the perfect colour scheme for the room, and then I just barged in and stuck my big blue tank in the corner of the room. Although bewildered (I have no sense of fashion or design) I felt my wife’s pain. So I bought a whole load of black and white decorations for the tank, and created a theme that I was really proud of! We have selected all of the items above based on their overall quality, their average customer ratings and their value for money. We hope you agree that all of the above items fit this criteria, and we hope you get plenty of enjoyment from them. Feel free to explore other items that we have here on FishTankBank!